Is Fox working on a Fantastic Four Versus X-Men movie? Check out four insane clips from the mythological epic Legend of Hercules. Find out which characters will get their own episodes when The Walking Dead returns. 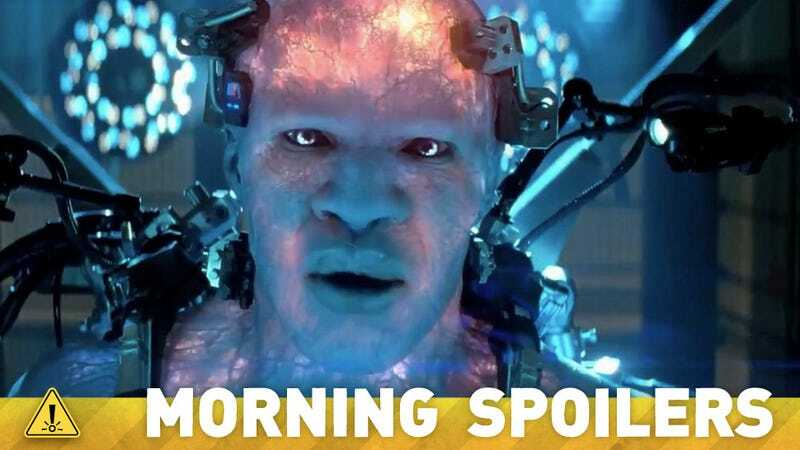 Amazing Spider-Man 2 continues to tease a bunch of villains. Plus: a closer look at Captain America: The Winter Soldier. Spoilers now! According to a report on investor website Motley Fool, 21st Century Fox is planning to cross over two of its Marvel properties in an Avengers-style plan. A reboot of Fantastic Four is due in 2015 and X-Men: Apocalypse has been scheduled for 2016. Reportedly, Fox is looking to combine the two in a film based on the 1987 comic Fantastic Four Versus X-Men. Bear in mind, there's no official source for this report — and it may just be a Motley Fool columnist jumping to conclusions. Brand New Footage From the Doctor Who Christmas special! Fancy Dan Brito said during his arraignment for the recent Brighton Beach shootout, "Everything has a price. Including the head of so-called superheroes. A shocking Midtown bank robbery was foiled yesterday by Spider-Man. New York's superhuman vigilante caught the mechanically augmented robber, suspected in two previous bank heists, as he fled the scene with the stolen loot. Police arrived on the scene as Spider-Man finished webbing up the suspect, who was arrested and later identified as disgruntled engineer, Herman Schultz. Schultz created wrist-gauntlets that are capable of emitting a vibratory wave of pressure that proved capable of tearing apart a four-foot thick steel vault. NYPD Special Crimes Unit Detective Stan Carter stated that Schultz had officially been remanded into custody and is being held at the Ravencroft Institute pending his preliminary hearing. When asked how a "disgruntled engineer" could create such dangerous weapons, Carter said, "Shocking, right? All that genius but no escape plan." Just wait, all I will say is just wait for what this kid [Chandler Riggs] is going to do this season. He I think has done one of the best episodes certainly this season, and he kind of carries it. It's beautiful what he's done.